You don't have to dress all in red to reap the benefits of this bold color. Sometimes, just a hint of red works just fine. 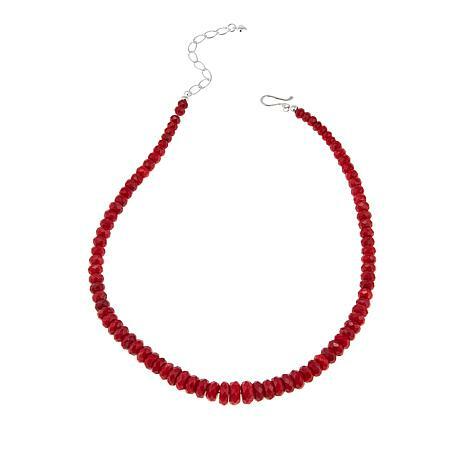 For those times when less is more, turn to this red sea bamboo coral necklace. Vibrant red coral in a classic, graduated silhouette, makes it easy to make a style statement all your own! This is just lovely. I ordered a second on sale to wear nested. Sparkles and is a great color. Haven't worn this yet, but really like the faceted beads. 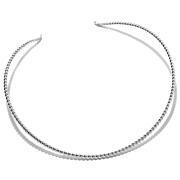 They add another dimension to this necklace. I had also ordered the red coral and turquoise earrings (which I love) and this coral goes really well with them. Good job, Jay!! 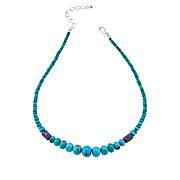 Fabulous color is probably my favorite thing about this necklace. The faceting and sparkle add an elegant touch to an organic piece. The color is perfect. The Length is perfect short or long. 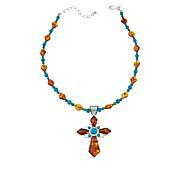 The faceted coral brings out the beauty even more. I really enjoy wearing this coral necklace. The color is beautiful. I love that Jay gives you options with length. I just wish the beads were bigger. I know it was marked down. It's ok, just doesn't wow me like some of his other pieces do. 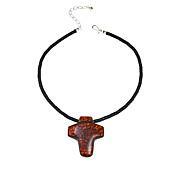 Ladies, if you are looking for a nice true red necklace, not on the chunky side, this is for you, because it is pretty.